Now, being prepared for almost anything, he was not by any means prepared for nothing; and, consequently, when the Bell struck One, and no shape appeared, he was taken with a violent fit of trembling. Five minutes, ten minutes, a quarter of an hour went by, yet nothing came. All this time, he lay upon his bed, the very core and centre of a blaze of ruddy light, which streamed upon it when the clock proclaimed the hour; and which, being only light, was more alarming than a dozen ghosts, as he was powerless to make out what it meant, or would be at; and was sometimes apprehensive that he might be at that very moment an interesting case of spontaneous combustion,1)In Chapter 32 of Dickens’ novel Bleak House (first published as part of a serial in December 1852) Krook, who made a living as a Rag and Bottle man, a dealer in junk, dies when he spontaneously bursts into flames. This led to a bit of a courteous Victorian-stye flamewar with the literary critic George Lewes. without having the consolation of knowing it. At last, however, he began to think—as you or I would have thought at first; for it is always the person not in the predicament who knows what ought to have been done in it, and would unquestionably have done it too—at last, I say, he began to think that the source and secret of this ghostly light might be in the adjoining room, from whence, on further tracing it, it seemed to shine. This idea taking full possession of his mind, he got up softly and shuffled in his slippers to the door. For, the people who were shovelling away on the housetops were jovial and full of glee; calling out to one another from the parapets, and now and then exchanging a facetious snowball—better-natured missile far than many a wordy jest—laughing heartily if it went right and not less heartily if it went wrong. The poulterers’ shops were still half open, and the fruiterers’ were radiant in their glory. There were great, round, pot-bellied baskets of chestnuts, shaped like the waistcoats of jolly old gentlemen, lolling at the doors, and tumbling out into the street in their apoplectic opulence. There were ruddy, brown-faced, broad-girthed Spanish Onions, shining in the fatness of their growth like Spanish Friars, and winking from their shelves in wanton slyness at the girls as they went by, and glanced demurely at the hung-up mistletoe. There were pears and apples, clustered high in blooming pyramids; there were bunches of grapes, made, in the shopkeepers’ benevolence to dangle from conspicuous hooks, that people’s mouths might water gratis as they passed; there were piles of filberts, mossy and brown, recalling, in their fragrance, ancient walks among the woods, and pleasant shufflings ankle deep through withered leaves; there were Norfolk Biffins,6)Norfok Biffins are an archaic or heritage apple developed in Norfok, England. The name is derived from Norfolk beefing, a name that was presumably inspired by the deep red color of the apple. They’re a keeper apple, often used in baking and cider, but frequently dried and stored for later use. squat and swarthy, setting off the yellow of the oranges and lemons, and, in the great compactness of their juicy persons, urgently entreating and beseeching to be carried home in paper bags and eaten after dinner. The very gold and silver fish, set forth among these choice fruits in a bowl, though members of a dull and stagnant-blooded race, appeared to know that there was something going on; and, to a fish, went gasping round and round their little world in slow and passionless excitement. The Grocers’! oh, the Grocers’! nearly closed, with perhaps two shutters down, or one; but through those gaps such glimpses! It was not alone that the scales descending on the counter made a merry sound, or that the twine and roller parted company so briskly, or that the canisters were rattled up and down like juggling tricks, or even that the blended scents of tea and coffee were so grateful to the nose, or even that the raisins were so plentiful and rare, the almonds so extremely white, the sticks of cinnamon so long and straight, the other spices so delicious, the candied fruits so caked and spotted with molten sugar as to make the coldest lookers-on feel faint and subsequently bilious. Nor was it that the figs were moist and pulpy, or that the French plums7)French plums were a preserved plum imported from France, and particularly favored as a Christmas delicacy. blushed in modest tartness from their highly-decorated boxes, or that everything was good to eat and in its Christmas dress; but the customers were all so hurried and so eager in the hopeful promise of the day, that they tumbled up against each other at the door, crashing their wicker baskets wildly, and left their purchases upon the counter, and came running back to fetch them, and committed hundreds of the like mistakes, in the best humour possible; while the Grocer and his people were so frank and fresh that the polished hearts with which they fastened their aprons behind might have been their own, worn outside for general inspection, and for Christmas daws to peck at if they chose. But soon the steeples called good people all, to church and chapel, and away they came, flocking through the streets in their best clothes, and with their gayest faces. And at the same time there emerged from scores of bye-streets, lanes, and nameless turnings, innumerable people, carrying their dinners to the bakers’ shops.8)Bakers were not allowed to bake on the Sabbath, but even on non-Sabbath days, since ordinary people did not have an actual oven, their Christmas roast or goose would be cooked in the hot but otherwise unused baker’s oven. 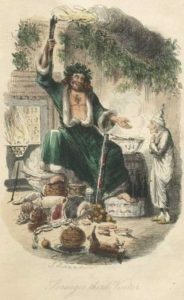 The sight of these poor revellers appeared to interest the Spirit very much, for he stood with Scrooge beside him in a baker’s doorway, and taking off the covers as their bearers passed, sprinkled incense on their dinners from his torch. And it was a very uncommon kind of torch, for once or twice when there were angry words between some dinner-carriers who had jostled each other, he shed a few drops of water on them from it, and their good humour was restored directly. For they said, it was a shame to quarrel upon Christmas Day. And so it was! God love it, so it was! 1. ↑ In Chapter 32 of Dickens’ novel Bleak House (first published as part of a serial in December 1852) Krook, who made a living as a Rag and Bottle man, a dealer in junk, dies when he spontaneously bursts into flames. This led to a bit of a courteous Victorian-stye flamewar with the literary critic George Lewes. 2. ↑ Brawn is either the meat of a boar or headcheese, and given the season and setting, it’s probably boar. 4. ↑ Punch in Dickens’ era was general a mixture of spirits and fruit and spices that was served hot. 6. ↑ Norfok Biffins are an archaic or heritage apple developed in Norfok, England. The name is derived from Norfolk beefing, a name that was presumably inspired by the deep red color of the apple. They’re a keeper apple, often used in baking and cider, but frequently dried and stored for later use. 7. ↑ French plums were a preserved plum imported from France, and particularly favored as a Christmas delicacy. 8. ↑ Bakers were not allowed to bake on the Sabbath, but even on non-Sabbath days, since ordinary people did not have an actual oven, their Christmas roast or goose would be cooked in the hot but otherwise unused baker’s oven.